A fun way to give our most popular candies! 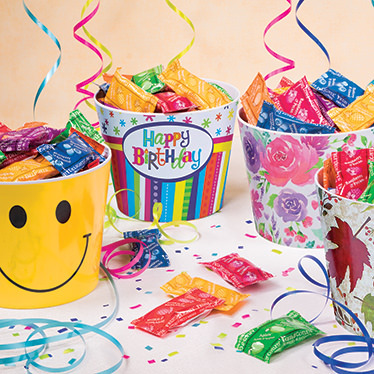 We've filled a charming assortment of durable, 5.5-inch tall Melamine buckets with 50 individually-wrapped pieces of our Minis confections in all their favorite flavors! Includes Aplets & Cotlets, Fruit Delights, Dessert Delights, and Tropical Delights. After the candies are gone, the bucket will be a sweet reminder of your thoughtfulness. Kosher. Tropical Delights Minis: sugar, corn syrup, nutmeats (macadamias, cashews), modified corn starch, pectin (pectin, disodium diphosphate, sodium polyphosphate, dextrose, dicalcium phosphate), fruit (pineapple, mango, passion fruit), natural flavors, sodium citrate, citric acid, malic acid, soy lecithin.